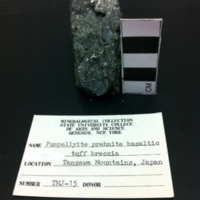 The color is mainly a very dark green to dark grey. Some parts of the rock exhibit greasy luster. There are some tannish white spots and some slightly larger dark brown spots. 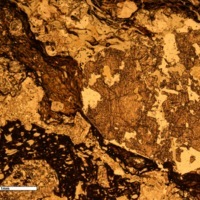 The tannish white mineral reacts with acid. 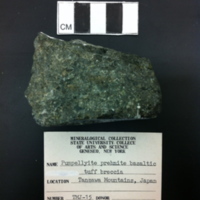 There are dark green and faded dark green phenocrysts(~3mm in size). 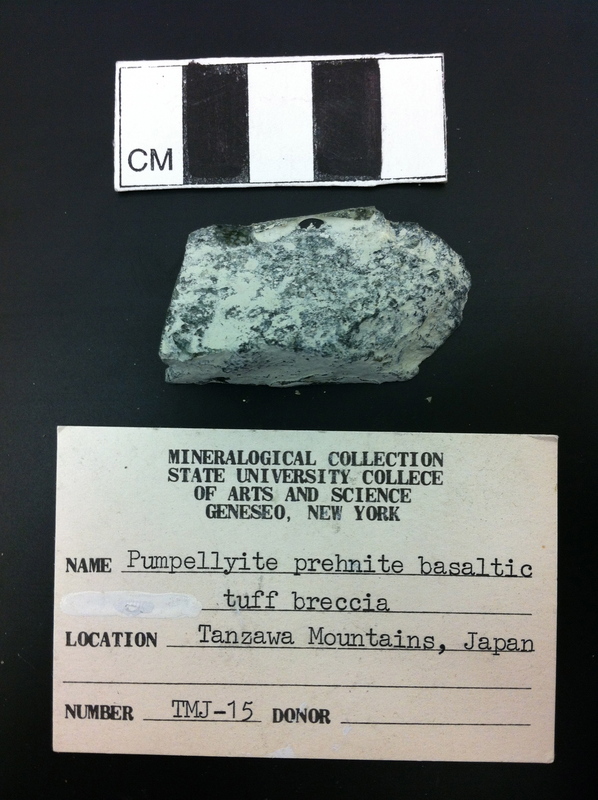 There are medium to coarse grained white phenocrysts (2-10mm). 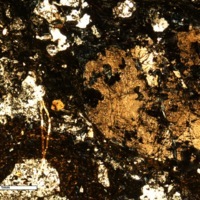 Some phenocrysts touch each other with no matrix in between. There are some areas that possess a dark grey matrix. 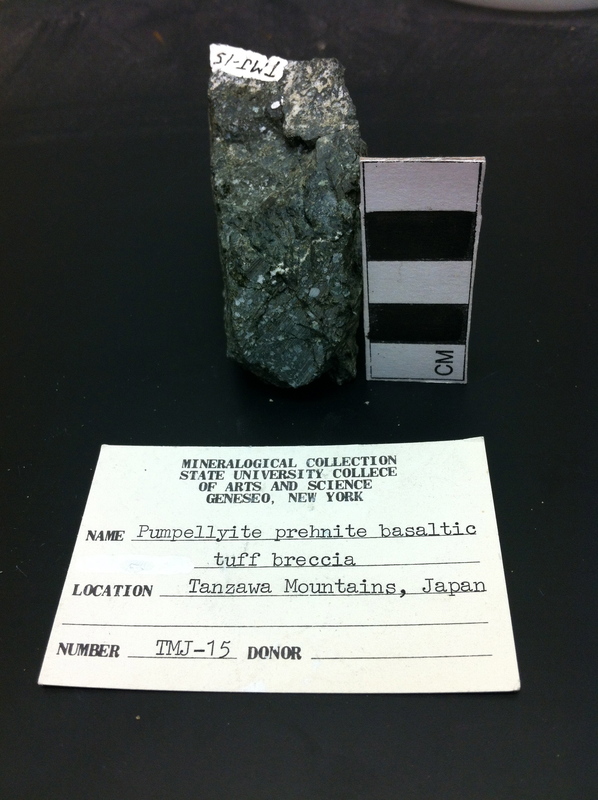 There are many fractures through out the sample. It has a rough and bumpy texture overall. There are many micro-fractures and veins. There are many larger fractures as well. There are also circular crystals that have a pointed center. 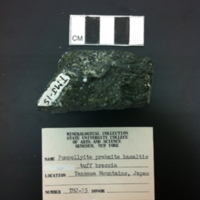 Some of the augite crystals are severely fractured, and have quartz veins running through the fractures. There are many elongated quartz crystals that are curved. There is some glass intergrown into the circular crystals. 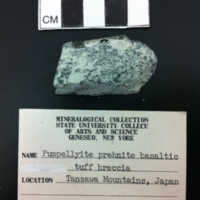 “Pumpellyite Prehnite Basaltic Tuff Breccia,” Geneseo Geoscience Collections, accessed April 25, 2019, http://www.geosciencecollections.milne-library.org/items/show/358.